The VSE150 from ifm electronic is a 6-channel diagnostic system designed to evaluate four dynamic signals (e.g. rotational acceleration) and two analog inputs. 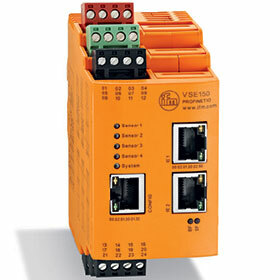 The new VSE15x family provides different fieldbus interfaces to exchange data with a PLC. This makes it possible to display the measuring values directly on the control system and optimally adapt the monitoring functions to the operating states and processes of the machine. In addition to the fieldbus, two fast digital switching outputs are provided for time-critical alarms. The direct PLC connection via fieldbus allows auxiliary parameters (e.g. rotational speed and triggers for operating states), as well as non-critical alarms from condition monitoring to be exchanged over the bus. This not only reduces wiring complexity but also saves the cost of providing the corresponding inputs/outputs on the PLC. Machines with varying processes, such as machine tools, have high demands on condition monitoring systems. To recognise deterioration in quality at an early stage and avoid scrap, or even damage, a process-dependent detection of even the smallest change is necessary. This can only be achieved by interlinking the operating parameters (e.g. rotational speed, power consumption, feed rate, tool etc.) and the vibration data – ideally in the PLC. This combination of control and condition monitoring data enables process-dependent monitoring, leading to a considerable increase in quality and process reliability. The same applies to diagnosis (rolling-element bearing condition, ball screw, unbalance), where, in many cases, a high degree of diagnostic validity can only achieved by combining the vibration monitoring data with the machine/process parameters of the PLC. Influencing process factors must be minimised and the measured data evaluated systematically. Here, too, integrating condition monitoring with the PLC is an enormous advantage and a direct fieldbus connection provides the optimal solution. If machine protection is part of the monitoring concept, a fast response is critical to minimise potential damage. For time critical alarms, the diagnostic electronics provides two additional digital outputs with a response time of 1 ms, which can be used to initiate an immediate machine stop to minimise, or even completely avoid, consequential damage.